Hey NYC! Come and see us at The Cutting Room this Tuesday the 17th where we’ll play and talk about our reality show and new book. Get tickets at thecuttingroomnyc.com. Legendary country brother duo The Bellamy Brothers are celebrating 40 years in Country Music with a live performance in front of an exclusive Sirius XM subscriber only audience. Hosted by Country Star and longtime friend of the Bellamy’s, TG Sheppard. 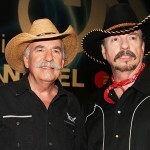 Veteran country performers the Bellamy Brothers have a new project on the market — one that David Bellamy says is the perfect mix of the past and the present. 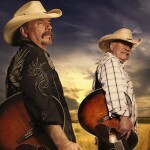 The Bellamy Brothers are taking a different approach to a greatest hits compilation. In celebrating their 40th anniversary, the country legends’ brand-new 40 Years: The Album is a two-disc set that not only includes 20 of their best-loved hits, but also an album featuring 20 new tunes. “With greatest hits packages, people always expect certain songs. Howard and I wanted to figure out how to do that and still do new music,” David Bellamy tells Rolling Stone Country. The first disc includes such Bellamy classics as “Redneck Girl,” Sugar Daddy,” “Crazy From the Heart,” “Lovers Live Longer,” “Old Hippie,” a live version of “You Ain’t Just Whistlin’ Dixie” and their signature song, “Let Your Love Flow.” The duo recently filmed a new video for that classic hit, featuring 60 breast cancer survivors from the Fort Worth, Texas area. 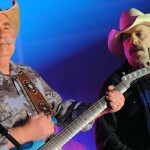 2014 has seen country music mainstays The Bellamy Brothers racking up the miles. David Bellamy tells Billboard that they, to quote Hank Snow, have been everywhere this year. “Our tour has actually zigzagged the world this year. We started off the year in India and Sri Lanka, came back and did a lot of dates in the United States. Then we went back to Switzerland, then Texas, and Germany. We’re in Indiana at the moment, then in the middle part of August, we’ll go to the Middle East,” he says of their whirlwind schedule.